The PTA (pure terephthalic acid) is an important raw material for the production of chemical fiber. In the production process of PTA, acetic acids are widely used as the solvent while hydrobromic acids are usually chosen as the accelerant. In the oxidation section of a PTA project, the thin film evaporator is introduced for the residue slurry disposal systems. 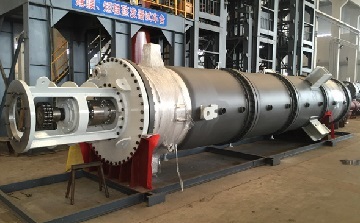 The typical working conditions may include “7.7~9.0 MPa, water steam at 300~320°C, with acetic acid vapor, high viscosity of slurry discharged, etc”. Considering the harsh working environment, Hastelloy C-276 alloy is used for the construction of its internal parts. A thin film evaporator for a PTA project in US. The internal parts are made of Hastelloy C-276 to withstand the harsh working conditions. Why choose Hastelloy C-276? Because Hastelloy C276 has excellent corrosion resistance to acetic acid and hydrobromic acid. It also exhibits very good resistance to intergranular corrosion and stress corrosion at high temperatures and high pressures. Especially, it has outstanding resistance to erosion caused by the motion of high-concentration residue slurry.